The fashion industry is a very hectic place. One week there are cool colors, the next week there are earth tones. The next big “fashion trend” is, for the most part, unpredictable. The taste makers of the world dictate that which we see on a regular daily basis, and as of lately, they have exposed us to the “high fashion” labels like Versace, Gucci, Louis Vuitton, and many more upper class clothing designers and manufacturers. Being that everyone wants to have a taste of high society, the more affordable clothing companies and designers have begun to mimic the styles of the more expensive clothing lines. I remember rockin the Marc Ecko red bottom shoes, simply because they resembled a more expensive design. Yet, design usually isn’t the reason we buy clothes. Well over 50% of my colleagues and friends buy clothes because of a brand, and they are willing to pay outrageous amounts of money for clothes designed by those that are… for the most part, only out to make money. I bring this point to our attention because I have also seen a trend that most others fail to see. 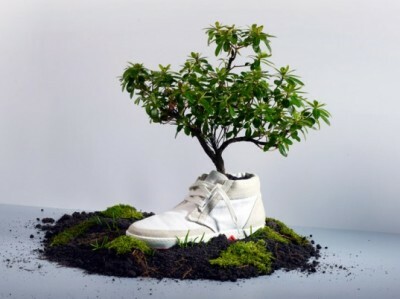 It’s a trend that will change the face of the fashion industry, and has begun to build momentum with the help of awareness campaigns about sustainable business practices. Organic clothing and dyes have begun to show up in many clothing manufacturer’s supply lists along with sustainable energy and manufacturing methods, and there are more than a few good reasons for this rise in “green” clothing products. Many of us (and by “us” I mean the early 90’s /late 80’s babies) think of hippies and environmental activists when we think of “organic” anything. This is a stigma that is caused mostly by the fear of the unknown and different. Yet, if we push these unknown fears out of our mind we see that these alternative methods of clothing production are good for many more things than just our fashion. Organic clothing production helps not only our environment, but our health, our communities, and our economy. Hemp is the main source of organic fabrics. The pros of hemp production far outweigh those of cotton production, and hemp even costs less to make. Hemp also replenishes the environments that it is cultivated in, leaving the land richer and able to produce each hemp crop faster than the last. This would undoubtedly have a large effect on our economy as less and less fertilizers would be needed the longer we produce hemp (not to mention hemp can be used to fertilize other crops). Many organic clothing lines are fairly expensive, yet, they offer durability and strength that is far superior to the available “designer” lines. I have come across many green and organic clothing websites that offer everything from belts and wallets made from recycled tires, to flannels and bikinis made from organic hemp. Methods used to produce truly organic clothing are safer for the environment. However, the methods also cost much more than those that use chemical dies and treated cottons. This is due to the low demand for “green” organic products. The Louis Vuittons of the world do not use these methods, and somehow their clothes are almost twice as much in stores as organic clothes. A big issue with organic clothing is design and color. Many of the dyes and processes used for organic clothing leave little option for designs and colors. However, with the development of more and more natural colors and the recent developments in organic plastics (for environmentally safe transfers and silk screen inks), clothing manufacturers will soon offer brighter, more intricate designs and styles. One leader in organic fashion is a swimwear company named Nikster. This company combines amazing bikini design and organic materials and sustainable manufacturing methods to produce some of the most stunning swimwear available. They are easily a great replacement for those Gucci, Prada, and Fendi bikinis. Another clothing manufacturer that practices sustainable methods of production, and provides stylish hemp clothing is Seedless Clothing Company. This company is geared towards the marijuana enthusiasts and graffiti artists in the world (two of my favorite past times) yet their designs and styles are all very unique. Many of their products are made from the very plant they advocate, hemp.